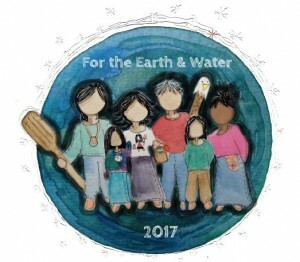 Josephine Mandamin hosted a conference call on Wednesday, February 15 to discuss the For the Earth and Water Walk – West to the East that will begin on April 19 or 20. The route map is in progress. Joanne is working on putting dates to the seven significant stopping points and will discuss with Josephine. could someone put on a FB auction similar to the one Christi Belcourt did? 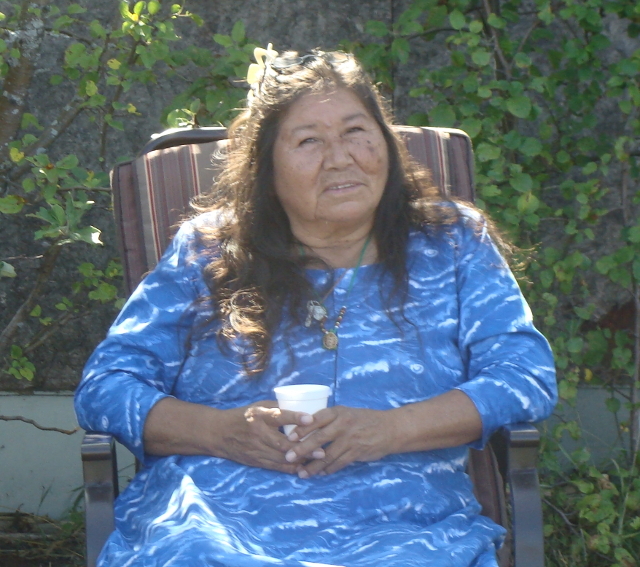 On Monday, March 13, 2017, Grandmother Josephine Mandamin held her 4th conference call to discuss For the Earth and Water Walk 2017. On the line were: Tasha, Joanne, Julia, Lyz, and Edward. Tasha reported on the upcoming auction. 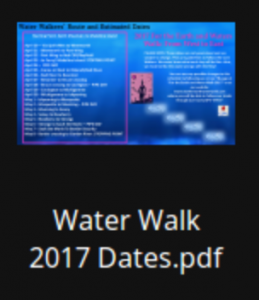 The FB page is up: 2017 Water Walk Auction. The auction will go live on Friday, March 17 and will end on April 7 at 7:00 PM Eastern. 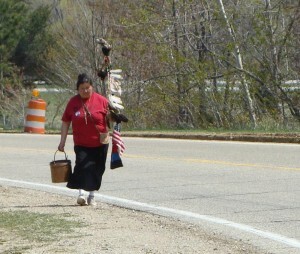 Anyone from anywhere on Turtle Island can donate items to be auctioned. Items that have done well at previous auctions include: artwork, earrings, moccasins, copper vessels, wooden bowls, blankets, ribbon shirts, ribbon skirts, childrens’ ribbon shirts, pillows. Please do not donate clothing other than Hudson Bay or handmade. Auction items may be gently used, but in good shape. Questions about donations can be directed to Tasha. Josephine has already received a beautiful basket donated by Kathy, and Christi donated three incredible prints. Lyz is looking into Spirit Mountain accommodations. There’s a hotel right off the freeway, America’s Best Value Inn. We will want to block 15-20 rooms and will need access to the conference room. Lyz will see if the hotel would be willing to give us a discount in return for promotion on our websites and social media. We have at least 20-30,000 followers. And the hotel management would be water protectors! Lyz has also reached out to water-focused organizations and will direct them to the auction. There will be a fundraising event in Duluth. The layout for the brochure is done except for imagery, which Joanne will provide to Lyz. Edward will send What the Water Walk Isn’t. Lyz will send Josephine and Joanne the brochure for review before printing. We hope to hear from Lorraine and/or Sue soon about Madeline Island. Edward’s website is up: Picking Up the Bundles Canoe Journey. If the water is frozen or too rough in the Bayfield area, Edward might walk instead of canoeing and launch in Bad River or Sault Ste. Marie, as conditions allow. Edward’s website is up. The t-shirts have made $250 so far! 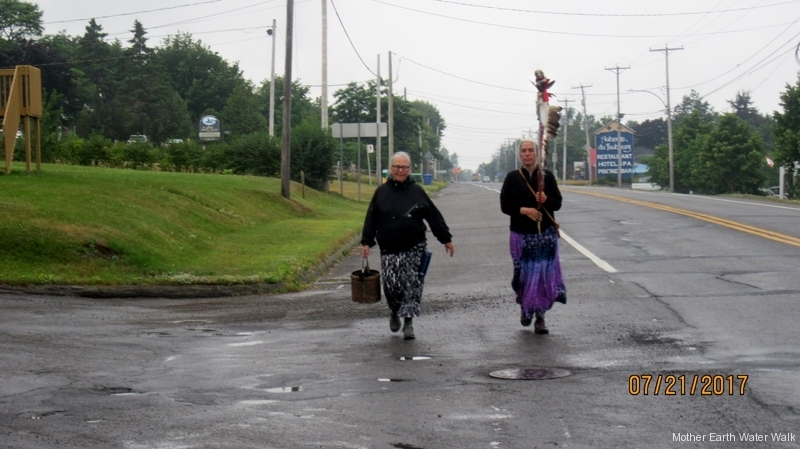 Since 2003, Grandmother Josephine Mandamin and other water walkers have been walking around the Great Lakes to draw attention to the importance of them and to the importance of water. This year’s walk – and what is to be Grandmother Josephine’s last walk – will begin on April 19 in Duluth, MN and end in Matane, QC. 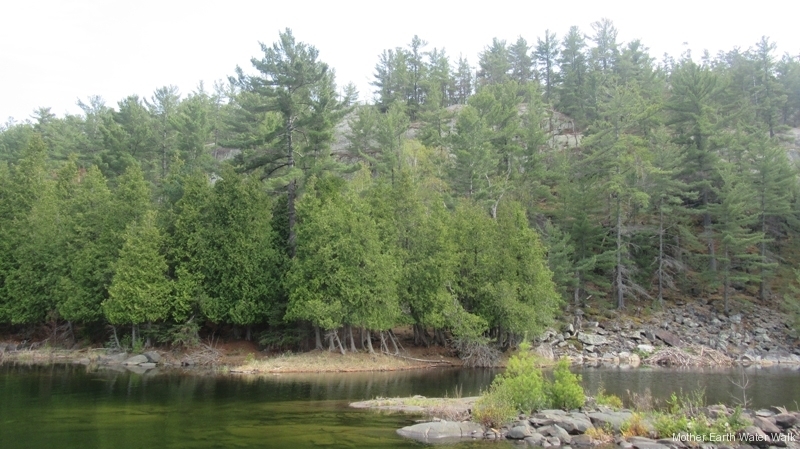 There will be a simultaneous canoe journey that will travel the same route. You can learn more about it here. As well, check out the list of locations(below) to where this journey will take the walkers and plan to join them for as long as you can, drop by and offer support and encouragement and find some way to celebrate them! The auction has two weeks to go, and people are still welcome to post items. Artists and businesspeople who donate artwork or services can generate publicity for themselves as well as benefitting the water. Tasha and her team are working hard on the auction and it’s already generated much interest and much generosity on the part of donors and bidders alike! The brochure and postcards can be printed from the imagery on the website. Walkers are encouraged to hand out postcards on the road to educate the public about the Walk. Water Protectors of Milwaukee wants to do a fundraiser in connection with a 4-week film festival about water issues. Josephine will be in Milwaukee April 9 and 10, visiting the Indian Community School. She might not have time to do an event with the Milwaukee Water Protectors. Sioban is keeping her schedule. A well-known Cree artist made a beautiful picture of Josephine with the moon and petroglyphs that we have been given permission to use for t-shirts. Tasha and Joanne are working on a press release that can be tailored for each community where the Walk will be stopping. 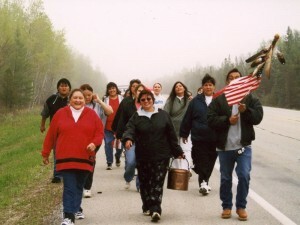 Josephine will leave for the Walk from Thunder Bay on April 19. There will be a sunrise ceremony April 20. 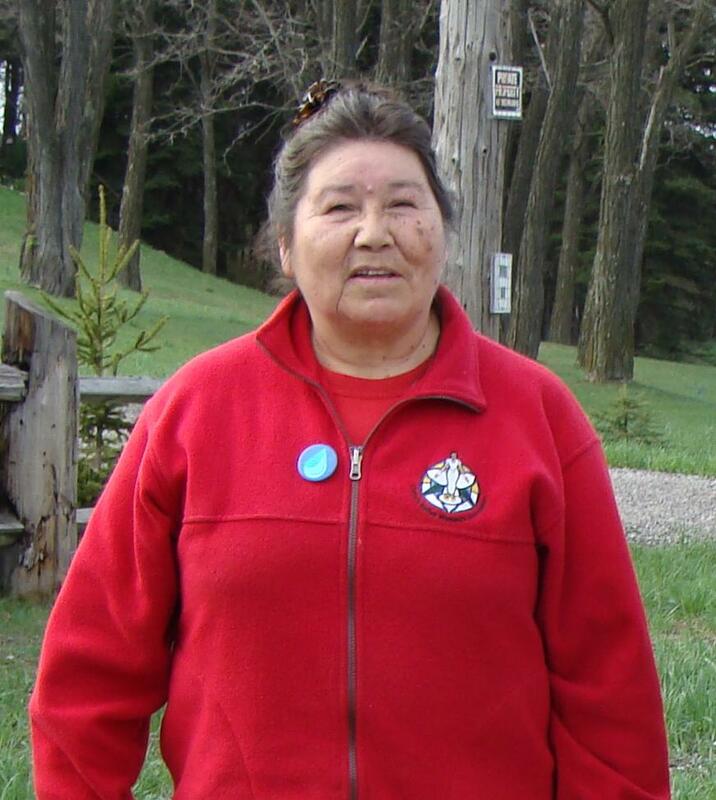 Josephine recently visited Grand Chief Edward Benton-Banai, who may join the beginning of the Walk. 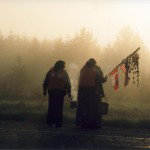 The canoe journey may or may not begin at the beginning of the Walk, depending on conditions of the water and weather – if they can’t canoe, they will walk. Someone in Thunder Bay is working on a van rental. We will have a magnetic sign made for the side of the van. More information is needed on the ferry to Madeline Island – how many vehicles it can accommodate, what the fare is, and so on. The dates for Sault Ste. Marie and other stopping points are unknown at this time. Dates will be communicated when they have been determined. Go with the flow! The provincial police in Toronto are concerned about the traffic and the safety of the Walkers. Some of the route will be the same as in 2015. Tasha will also contact the head of the Aboriginal liaison who helped last year. All Walkers should have their own vehicles. The Walk cannot take responsibility for transporting people outside the core group. Lyz will submit the protocol sheet for Josephine’s review. Tasha will put the brochure and protocols up on FB when they have been finalized. The protocols include: no dogs, no bikes, no drugs, no alcohol. Anyone not respecting the Anishinaabe protocols put in place will be asked to leave the Walk. Tasha will make a FB event page for this Walk. People can post rideshare information and connect in other ways as well. Josephine is concerned about details for the first month of the Walk. We still need to confirm point people and scouts. This is a Letter of Support for the Mother Earth Water Walk 2017. 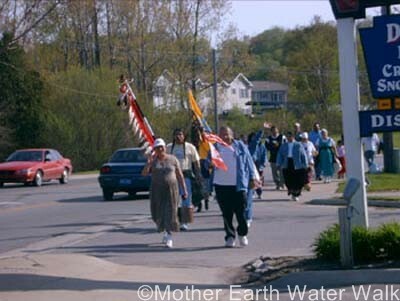 The Mother Earth Water Walks began in 2003 till present 2017 led by Grandmother Josephine Mandamin. 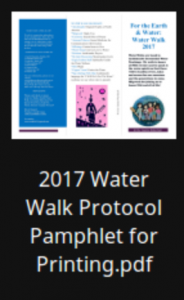 The purpose of the walks is to draw attention and create awareness of the importance of the water. 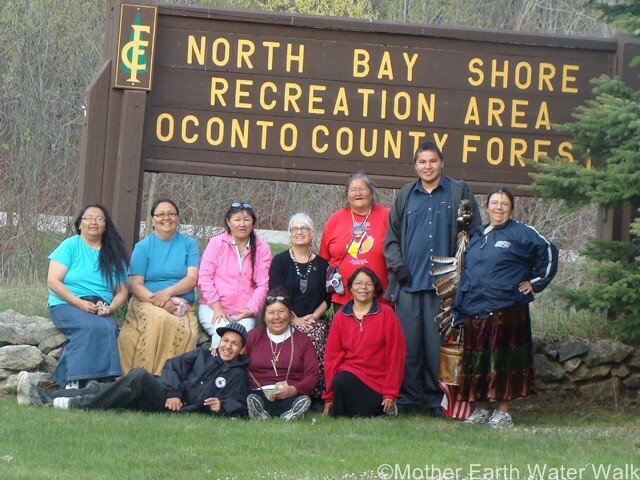 We as Anishnabe caretakers and Protectors of the land and the natural elements gifted to us by our Creator and placed upon our Mother the Earth can share in this most important responsibility to ensure there will be water for the generations next to come. Patricia Shawnoo-Ogitchada Quay a grass roots organizer and a Waterwalker, Supporter, Representative to the Mother Earth Water Walk. She will meet with Chiefs & Councils, Organizations, Grassroots Groups, and Non-Native Leadership & Supporters to organize ways to support this years Mother Earth Water walk on behalf of Lead Grandmother Waterwalker Josephine Mandamin and 2017 Mother Earth Water Walk.Your Support is greatly needed and appreciated. We are looking forward to hearing from you soon.